/ 2-Part Blog / DOES DESIGN MATTER WHEN PICKING A PATIO DOOR FOR YOUR HOME? DOES DESIGN MATTER WHEN PICKING A PATIO DOOR FOR YOUR HOME? Patio doors are the gateway to your extended living space; they connect your living room to your exterior living space, increasing your floor space and generally making your home more attractive. But does the design of the door matter or should you just pick any patio door? 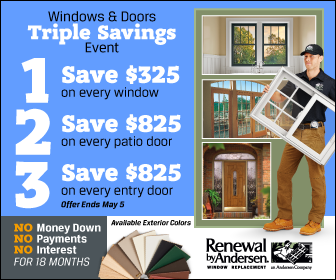 Renewal by Andersen® of St. Louis discusses the importance of your design choice. While there are plenty of patio door designs to choose from, there are two that st and out – French and sliding doors. Both doors offer specific benefits to your home and excel in specific areas but they can be summarized into either functional or aesthetic patio doors. French patio doors are more aesthetic while sliding doors are more functional. French doors are the “st andard” design choice for many homeowners, particularly those who live in traditionally designed homes like Colonial or craftsman houses. Their design exudes this classic appeal that blends well with almost any indoor or exterior living space design and pretty much becomes the center of attention for your living space. These doors swing open, so we recommend this design if your living space is large enough and can spare the actual space. If you want a door that matches and even improves the aesthetics of your living room and extended space, then this is the one for you. Sliding patio doors are a popular choice for both traditional and modern homes, but you’re more likely to find them in contemporary homes. The reason is that they’re more space efficient than French doors. They slide open instead of swinging open, and that means the doors themselves don’t take any extra space. They let more daylight into your home and consequently, more exterior views. If you’re looking for a door that maximizes space, then we recommend this one. Thinking of installing a new patio door but don’t know which one to get? Let our team help you with your choice! Give us a call at (314) 332-2364. We install patio throughout St. Louis, MO.